"If Elizabeth Medina walks the corridors of this castle, it is her spirit and not her living body." The Edgar Allan Poe movies of Roger Corman and Vincent Price are notorious for having only a tenuous connection to the author's original stories. This is more true with The Pit and the Pendulum than any of the others, mainly due to the fact that the Poe tale takes place in a single brief episode, most of which is in total blackness: not the most cinematically-friendly source material. Corman deftly dodges this by using the Poe tale as the springboard for the concluding act, and constructing a story out of a variety of Poe themes that makes for a decent pastiche. Francis Barnard (John Kerr) comes to the castle of the Medina family in Spain to learn how his sister Elizabeth (Barbara Steele) died. Elizabeth's death is shrouded in mystery, with her husband, Nicholas Medina (Vincent Price), edgily fabricating stories about the event. Soon, however, it comes out (through manifestations of Elizabeth) that Nicholas fears that he may have buried her prematurely. Soon, matters devolve into complete insanity, with Nicholas seemingly possessed by the spirit of his mad Inquisitor father, Sebastian (also Price). Before long, torture is in the wind, and the title apparati come into suspenseful play. Even though Roger Corman has a well-deserved reputation for making films cheaply and quickly, this is not as obvious here. More so than in House of Usher, his sets display an opulence in production value that is highly impressive. The Cinemascope screen is used very effectively, with characters and interesting detail filling the space much of the time and giving the picture a great deal of interest. The re-use of sets is disguised by creative camera angles and dolly shots, as well as distortions of various kinds. Intriguingly, he also uses unusual wipes and irises (including a rectangular iris that reduces the wide screen shape to a small feature, such as the eyes of a character). These all combine to make this seem like a much more expensive picture than it really was. Price is right on the border of hamminess, but manages to make Nicholas a sympathetic character, even when he's in full torture mode. Barbara Steele is gorgeous as always, but she doesn't have a lot to do until nearly the end of the film; as Corman reveals in the commentary, the high billing was to capitalize on the popularity of Black Sunday, made the year before. The minor players are decent, though not outstanding. Price and the set design are really the focal points of interest here, and they carry the movie exceedingly well. Les Baxter's score is understated and effective, making the suspense palpable in the final act as the pendulum makes its terrifying appearance. All in all, one of the most successful of the Poe/Price/Corman movies, and not to be missed by any horror fan. The concluding shot is unforgettable and makes for a highly gratifying climax. Image Transfer Review: The original Cinemascope framing is preserved although, unfortunately, it is not given an anamorphic presentation. Nonetheless, the picture looks very good and those without 16:9 displays should be very pleased indeed. Colors are excellent and eye-popping, particularly in the psychedelic opening and closing credit sequences. Blacks tend to be a little on the greenish side for most of the film, but are solid and dark in the climactic scenes and shadow details are very good. The source print is quite pleasing. The early sections have some speckling and minor frame damage, but once Price enters the picture, the print becomes practically pristine, indicating some care was taken in the video restoration: certainly, if you have a limited budget for such work, the scenes with Price would be what you want to look their best. Audio Transfer Review: The audio is interesting; dialogue is quite clear throughout, and the music has decent range. Hiss and noise are largely disguised by the constant sound of the ocean outside the castle, which runs through nearly the entire film. A very good mono mix that suits the film well. Extras Review: This disc has one of the best arrays of extras I've seen yet in MGM's Midnite Movies series. Starting matters off is a 2.35:1 nonanamorphic trailer in decent condition. A prologue (05m:00s) sets a framing story, in which the tale is told by Nicholas' sister Catherine (Luana Anders) in a madhouse. The disc refers to it as the original theatrical prologue, but as its 1.33:1 ratio confirms, this was an additional scene shot for television (to expand the running time to fill a two-hour slot with commercials). While it substantially undercuts the effectiveness of the story—by making it possibly the ravings of a madwoman—it also nicely subverts the romance that starts to blossom, subtly, during the movie proper. Apparently all did not end quite as well as might be implied by the conclusion of the picture. However, the best extra is the full-length commentary by director/producer Roger Corman. You can dismiss any ideas that you might have had about Corman being sloppy or interested only in a buck; he is clearly passionate about these movies, and he reveals a great deal about the intentions and subtext that probably was missed by the film's original drive-in audience. He goes into the Freudian influences, cinematic techniques and writing of the screenplay, though he is a little short on anecdotes about the filming. However, it's one of the better commentaries I've heard, granting this disc a very high grade for extras. 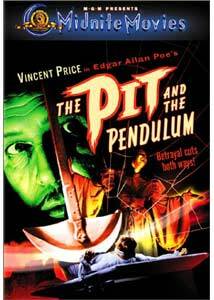 One of the best Poe/Price/Corman films, this is a gorgeous presentation, even though it is not anamorphic. Corman's commentary is a wonderful extra, as is the deleted prologue. Very highly recommended.